From A to Being: A feature, a Haven Giveaway, and Big Bertha! I've been so busy. I'm trying to finish up some projects, and of course starting new ones. Good News! The next Homemade Christmas Do-Over will be ready for you to see Monday! So that's awesome. Also, Craft Room Organizing will be revealed next week! Just a hint...it involves a new piece I've named BIG BERTHA!! When you see her, you'll understand why I've been so busy! I did have a chance to take a quick break to say hello and to see I've been featured!! This is only my second time being featured, so to me, it's a big deal! I'd like to take a minute to thank all of you! I've made a lot of new friends the past couple of months (since I started blogging) and I'm absolutely loving it! Thanks for sending Bloggers my way, and thanks for joining the ride. I was featured by Traci from Beneath My Heart!!!!!!!! 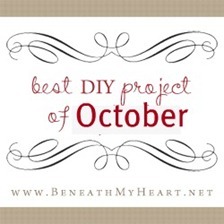 Stop by and Say hello and check out her features from the best DIY projects of October!!!!! There is a Haven ticket up for grabs at Creative Kristi! She is giving away a ticket to our Haven 2012 Conference in Atlanta, Georgia!" If you don't know about Haven Conference, click the logo above and sign yourself up! Or go visit Creative Kristi and enter to win a FREE ticket!!! !